Remote Desktop allows you to connect to your office computer from home or another remote location. The result is similar to logging in to Winstat, though Winstat will generally give you better performance and stability. However, if you have software on your office computer that is not available on Winstat, remote desktop will allow you to use that software from home. Macs can also use Remote Desktop to connect to office computers running Windows (Macs connecting to Macs use Screen Sharing instead). 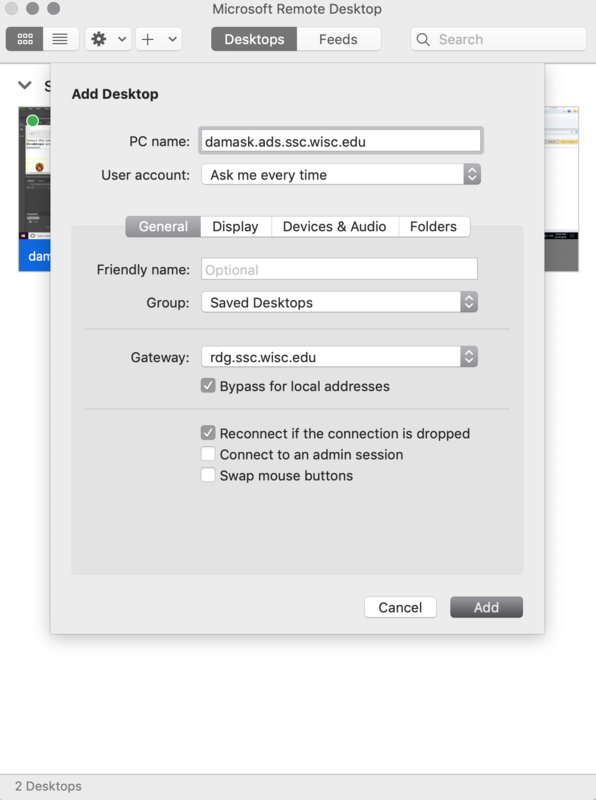 Connecting to your office computer using Remote Desktop is a great back-up plan in case you can't log in to Winstat, and we suggest all SSCC members learn how to do so. 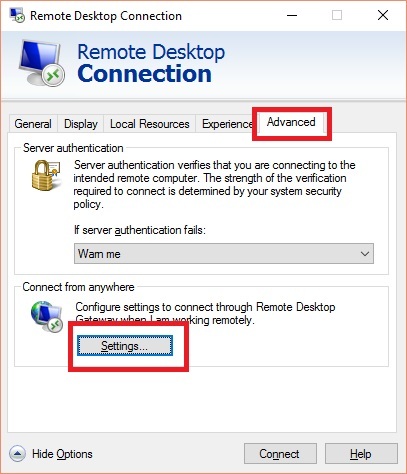 If you have a Remote Desktop connection already set up that requires you start VPN before using it, you can modify it so VPN is no longer required. In Windows, open the connection then click on Options as described here. On a Mac, edit your connection and then add a new gateway as described here. In order to allow Remote Desktop connections to your office PC, you will need to contact the SSCC Help Desk for us to enable this functionality on each of your devices. You can simply email the Help Desk with your computer's name and we will enable Remote Desktop for you, no need to set up an office call. To find your computer name, click Start and start typing "name" to search. Open View Your PC Name from the menu and look under Device Specifications for Device Name. The full name of your computer is what you see there plus .ads.ssc.wisc.edu (e.g. damask becomes damask.ads.ssc.wisc.edu). Computer names are not case-sensitive. Click the Windows logo button, All Programs, Accessories and Remote Desktop Connection. You'll then need to type in the name of your office computer. Select Show Options from the lower right hand corner. Select the Advanced tab, then in the Connect from anywhere section click the Settings button. 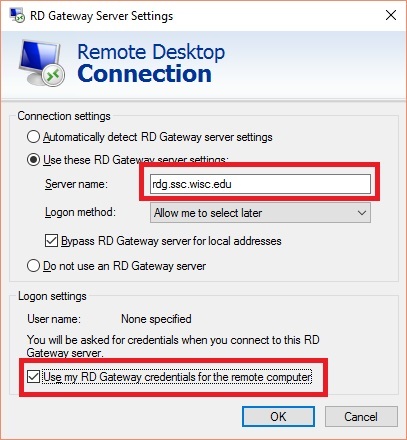 Select Use these RD Gateway server serttings and in the Server name box enter rdg.ssc.wisc.edu. Under Login settings, check the box for Use my RD Gateway credentials for the remote computer and click OK.
You are then ready to connect to your remote computer. Once you connect, you'll see that the remote connection takes over your screen and you can almost forget that you're not sitting in your office. If you want to go back to using the computer you're connecting from, click on the minimize button in the toolbar across the top of the screen. When you're done, log out of your office computer as usual. Remote Desktop Connection software can be downloaded and installed for free from the Mac App Store. Once installed, it can be found in the Applications folder. To set up your connection, click New in the upper left hand corner. Enter a name for the connection (ex. "My SSCC Desktop"), and the name of your office computer. Enter the name of your office computer and your SSCC credentials (using primo\username in the User Name field). From the Gateway dropdown box select Add Gateway to open the Gateway Preferences. To add a new gateway, select Add Gateway from the drop down menu. In the Gateway Name field enter SSCC RDG. 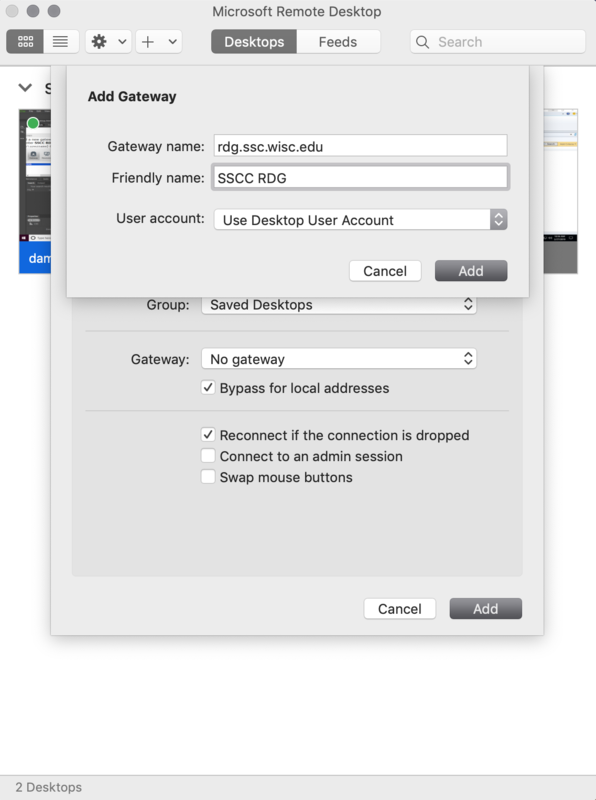 In Server name enter rdg.ssc.wisc.edu. Choose Use Desktop User Account and click Add. Select the newly created gateway from the drop down menu and then close the Edit Remote Desktops window. 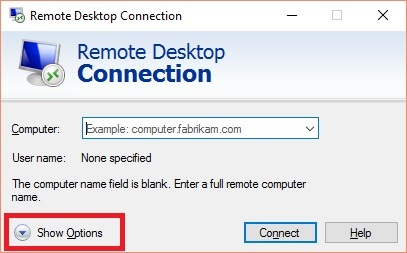 You can now select the connection and Start to begin your remote desktop session.